Treverward House, Treverward, Craven Arms. SY7 8LX.
. ..a newly refurbished and well equipped venue for hire at very reasonable rates, suitable for a variety of occasions: birthday parties and celebrations, art shows, business meetings, quiz evenings, live shows, theatre, yoga and more. There is ample parking and a wood pellet central heating system makes it a warm winter meeting place. We have good disabled access and the disabled toilet is big enough to double up as a changing room if necessary. T here is a well equipped kitchen, housing a new dishwasher and fridge and this can be soundproofed from the main hall with a new roller blind. 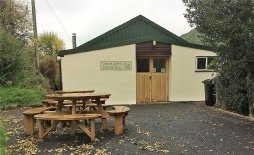 The exterior has also recently been improved with level tarmac and two solid picnic benches for fine weather use. 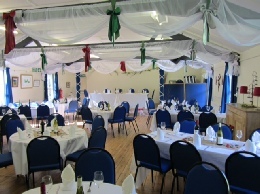 The Hall is available for private hire at very reasonable rates and free for events open to members of the local community. The agenda (as available) and date for the next meeting, draft minutes of the last meeting and minutes of previous meetings (in PDF format) are available by contacting the Chairman. Anyone is welcome to attend our meetings and put forward items for the agenda. Dances, quiz nights and lectures. Flicks in the Sticks, sponsored by Arts Alive, is shown in the Village Hall roughly once per month during the winter. We have our own cinema equipment and there is always a bar and pop corn with choc ices in the interval. The main hall is 44ft (13.5m) long x 26ft (8m) wide. 10 small square tables, good for playing bridge or a 4 person quiz team! The premises is licensed to be open from 9.00 am to 1.00 am. *It is possible to hire tables, chairs and some other equipment for a reasonable fee. Please contact Beryl Palmer. 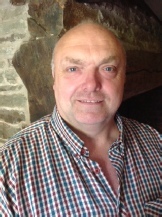 Chairman’s notes on recent meetings can be found below or by clicking here. Minutes of previous meetings can be requested in PDF form from Becky Sherman. This statement acts as the Village Hall’s (VH) policy for complying with the EU GDPR Regulation of 2016. It will be kept under review by the VH Committee of Trustees and updated in the light of changing circumstances and advice received. The VH operates this policy principally for the Legitimate Interest of carrying out its function of “….use for meetings, lectures and classes, and for other forms of recreation and leisure-time occupation, with the object of improving the conditions of life for the said inhabitants” as stated in the Trust Deed that is held by the Charities Commission. The VH maintains an electronic list of names and email addresses of people who have been asked to be kept informed of events taking place in the Redlake Valley. The Committee of Trustees acts as the Controllers of data and its use and any trustee with delegated authority from the committee may act as a Processor. The Village Hall aims to respond to all written/emailed requests from individuals about their personal data within seven working days and guarantees to respond within thirty days. It will carry out any deletions without query or delay. Personal data is stored securely on one computer to which only one trustee will have access while she/he has that delegated authority. Personal data will never be passed onto a third party. This statement will be a permanent fixture on our website. The path to the side of the hall will be cleared and tidied in the Spring and when there is a need. Sunday afternoon entertainment (mainly for winter) was approved. Hodre Pond is now the responsibility of a small group of volunteers; the Village Hall may be asked for small amounts of funding in the future. Village Hall Quiz The date for the Quiz was settled as Friday 7th December. Volunteers were requested for food preparation and help on the night. Community Building Funding: Beryl Palmer drew to the attention of the Committee the offering of grants by a charitable Foundation administered by the Shropshire Rural Communities Charity. The Committee received feedback from the Arts Alive Subcommittee. Arts Alive are struggling with funding and are asking Village Halls and entertainment venues to contribute extra to help. The committee agreed in principle to supporting Arts Alive as it provides an important service. They are discussing ways in which this can be achieved without compromising its charitable status. Christmas decorations to be put up before the Men’s Cooking Competition on Dec 1st. Some of the committee are concerned that enough people need to show up to the New Year’s Party; it will be run on the same format as normal ie. DIY. Start time will be 9.30pm. Housekeepers on duty need to check cleaning consumables and purchase necessary items (toilet rolls and drying paper etc.) before specific events. There is a problem with the drainage of the kitchen sink which will be investigated. The men’s toilets and hallway will be redecorated in the coming year.